Yes, I am already counting down. Yes, I am humming Jingle Bells as I type this. The point is Christmas will be here before we know it, and one of the best – yet sometimes most frustrating – parts of the holiday season is decorating your home. Mike is not a big fan of decorating, which leaves me doing most of the decking of the halls all by myself. Being only 5 feet tall and afraid of heights, that sometimes poses a bit of a problem. 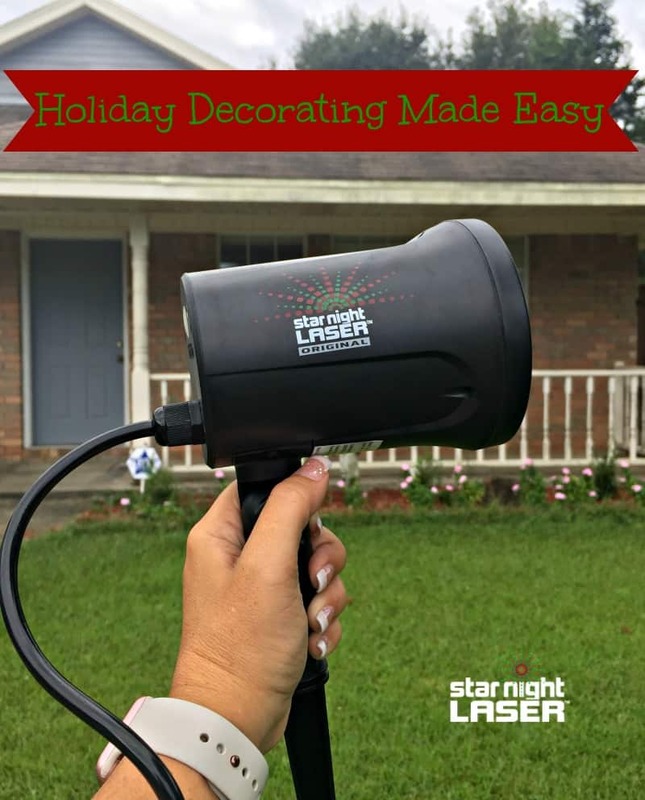 So when I got an email about StarNight Laser – the super easy way to decorate your entire home in one step, I was ecstatic! The StarNight Laser showers your home with thousands of little green and red star lights – perfect for the holiday season. Simply plug it in and point it at your home! Voila! No need to climb on a ladder, walk across rooftops (leave that for Santa) or worry with those silly plastic light hooks. Not to mention the time it takes to put the lights up… and take them down. As much as I love the holidays, it drives me crazy to see decorations up long past the New Year – however, I understand not wanting the chore of taking it all down. The StarNight Laser has eight different settings you can choose from to make your home twinkle. It is even water resistant – which is good because while we may not get any snow here in Florida, we certainly get plenty of rain. 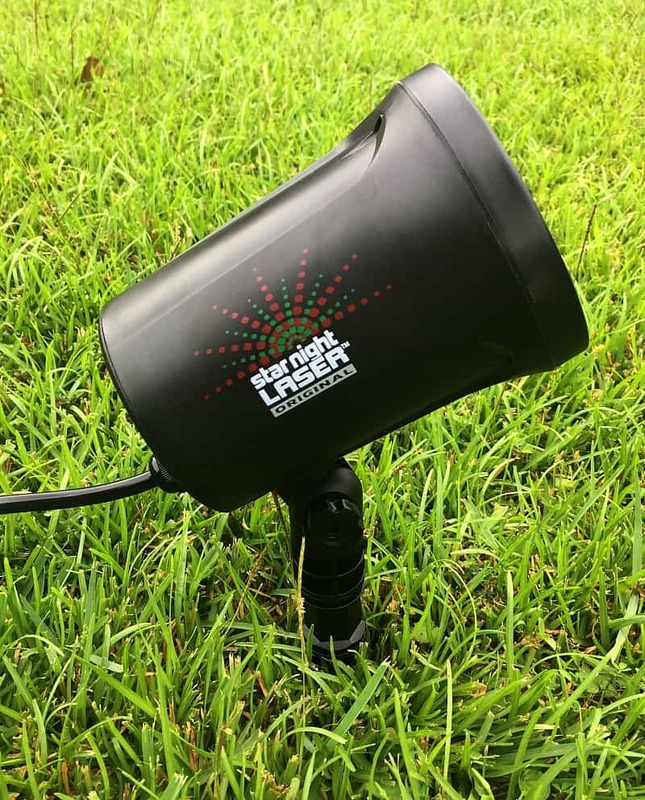 The laser easily detaches from the stake so you can choose to bring your StarNight Laser inside and put it back out again without having to poke a bunch of holes in your yard. I am so excited to decorate our home this year – I think the neighbors would kill me if I started now – and love that it will take me all of about .5 seconds to do so. I can spend more time this holiday season doing the fun stuff – like making Easy Christmas Cookies and Simple Wine Cork Wreaths! You can save now by ordering your StarNight Laser before the big holiday rush! Check out StarNightDeals.com to order your StarNight Laser and save up to 75%! Is this U.S. only? thanks! We have these and they are AWESOME!~! Easy as pie to put up and take down. Your house will be the talk of the neighborhood.